Following months of speculation, The Kroger Co. plans to test sales of own-brand groceries through Alibaba Group, China’s largest e-commerce retailer. Kroger said Tuesday that it will pilot the sale of items from its Simple Truth natural and organic brand via an online store on the Alibaba Tmall Global platform. With the move, Cincinnati-based Kroger said it’s introducing its private-label portfolio — dubbed Our Brands — to international customers for the first time. The initial test will give Alibaba’s 500 million-plus Chinese consumers access to the Simple Truth brand. "E-commerce enables Kroger to quickly scale to reach new customers and markets where we don't operate physical stores, starting with China," Kroger Chief Digital Officer Yael Cosset said in a statement. "We anticipate Chinese consumers will love Our Brands — starting with Simple Truth products — just like our American customers do. Kroger is proud to continue to lead the way in making natural, organic and free-from products more mainstream and accessible. Sharing Kroger's exclusive brands and status as a food authority the world over is exciting." Kroger noted that the partnership with Alibaba supports its Restock Kroger strategic plan to redefine the grocery customer experience by growing its private-brand program, creating customer value and driving top-line growth via alternative revenue streams. In terms of the bigger retailing picture, Kroger looks to be traveling a similar path as Walmart and Amazon, which have faced off to boost their e-commerce presence in potentially lucrative global markets such as China and India. 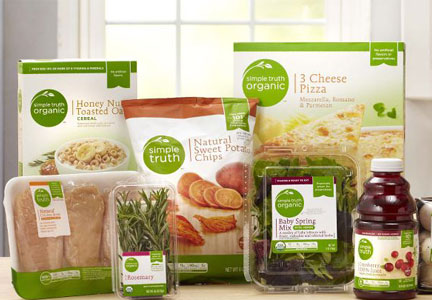 Simple Truth has become the second-largest brand sold in Kroger stores since launching five years ago. This year, the brand topped $2 billion in annual sales, which Kroger said makes it the nation’s largest natural and organic brand. Alibaba's Tmall Global platform, launched in 2014, is China's largest business-to-consumer marketplace. The platform enables brands and retailers without operations in China to build virtual storefronts and ship products into China.